When your baby is constipated, it can be difficult to help him get his bowels moving again. The pressure and pain leads to crankiness, and finding a safe solution for your baby's discomfort can quickly become your top priority. Many moms and pediatricians turn to apple juice as a quick cure for a constipated infant, but check with your child's doctor before giving him anything to loosen his bowel movements. According to the American Academy of Pediatrics at HealthyChildren.org, infants younger than six months of age should not be given juice. When stool backs up in the intestines, constipation is the result. Babies get constipated for many reasons, but the basic cause is that a developing digestive tract is too immature to send digesting food through it efficiently. Infrequent bowel movements don't necessarily mean your baby is constipated, though. While some babies have a daily bowel movement, others go for days without passing stool. True constipation also involves stool that's hard and difficult for the baby to pass. Apple juice works to alleviate infant constipation because its sugars, liquids and pectin give it a mild laxative effect. Offer 1 to 2 ounces of apple juice from a bottle or spoon up to twice a day to help ease the passage of stool through your baby's digestive tract. Don't give your child too much apple juice, because juices are high in sugar and fill an infant's stomach so he may not consume much of his normal breast milk or formula. This could cause him to lose valuable nutrients he needs to thrive. While apple juice works great as a gentle infant laxative, don't make the mistake of giving applesauce instead. The higher levels of pectin fiber in applesauce can bulk up stool too much, so this particular apple product could make things worse for your baby's blocked-up intestines. Bananas, rice and toast should also be off the menu while you are trying to relieve your child's constipation. Rice cereal can be a problem for some babies, so cut this food out of your infant's diet until he isn't constipated anymore. If a daily dose of apple juice isn't helping your baby, you can try holding him in a warm tub of water with his knees pulled up to his chest in a squatting position. You can also offer a tummy massage when he's lying on his back. 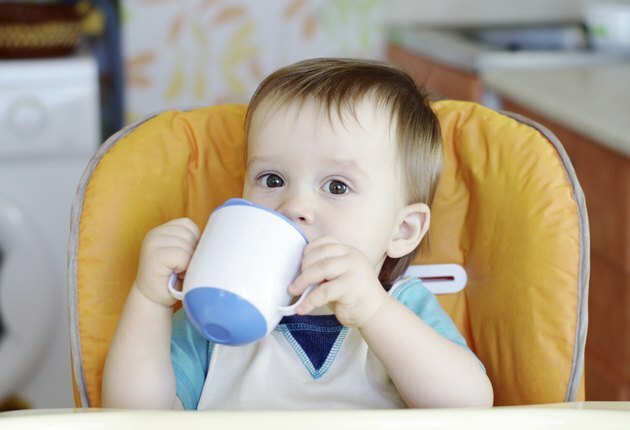 Make sure your baby is getting plenty of fluids, mostly in the form of breast milk or formula, which should be a child's primary source of calories until at least age 1. Are Pears Good for Constipation in Infants?